Once in a week, I prepare kuzhambu (or curry) with whole Moong Dhal or Channa or Cow peas (Thattai Payir). This week I just wanted to prepare something different and tried the same curry with Rajma. Mostly I run out of Drumstick while preparing these curries, fortunately I had them and with no further thoughts, I added it. This came out excellent and we had a feeling of eating something new though the preparation is the same. Soak Rajma overnight. Chop Pearl Onions. Chop Tomato and make puree.. Chop Drumstick and Brinjal into small pieces. Grind grated coconut along with little water to a fine paste. Pressure cook Rajma for 5-6 whistles or until done. Heat oil in a Pan. When hot, add Mustard seeds. When they start popping up, add Urad Dhal, Pearl Onions, Curry leaves, Turmeric Powder and Asafoetida. Fry till the onions turn translucent. Now add the tomato puree and fry till the oil separates. Now add chopped brinjal, Drumstick and Sambar Powder. Mix well and fry for a while. Now add water and salt. Allow boiling. When the veggies is almost cooked, add coconut paste. Mix well and allow further boiling. When the curry thickens to the desired consistency and the coconut paste gets combined well, add the tamarind paste. Boil for few more minutes until done. Serve with steamed rice and any vegetable stir fry. 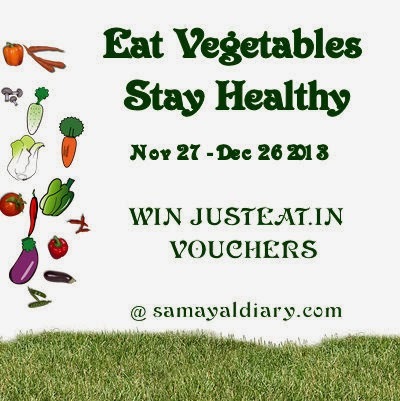 Participate in 'Eat Vegetables; Stay Healthy' event and win JUSTEAT.in vouchers. Never saw rajma preparation like this, Cooking like sambar is interesting! wow so very inviting and thats an very tempting combo looks fantastic dear !! Curry looks finger-licking good!! yum!!! Nice clicks too.. Healthy and delicious combination.. looks great!! online news hindi,today breaking news in hindi. Excellent post! !Seo is categorized as three types, here keywords in the sense approximately search result of a word averagely over a month. On-page optimizations means what are the changes which we are doing in our own site is called on-page optimizations. Off-page optimization means it refers to the activities that are outside our websites.Thank you..!! I really enjoyed while reading your article, the information you have delivered in this post was damn good. Keep sharing your post with efficient news. Wonderful Blog!!! Your post is very informative about the latest technology. Thank you for sharing the article with us. Our Digital Marketing Training is tailored for beginners who want to learn how to stand out digitally, whether it is for their own business or a personal brand. kickass website perfect for increasing leads for your business. The best thing is that your blog really informative thanks for your great information! Very good post, it's very useful to all blog readers and Keep sharing. Thanks for sharing such a wonderful article..
Nice post. I have been reading a lot of stuff on this topic in the last few months, but this article stands out with its simplicity & authenticity. Every passage made profound sense. Thanks a lot for this. Thanks a lot very much for the high quality and results-oriented help. and needs support about this area. What a fantastic post to sharing..thanks a lot..
Nice Post. Thanks for sharing this information. Thanks for the great post!!! Thanks for sharing this information I really enjoyed reading this article if you are looking for app developer, Hire App Developer from theunpluggedweb please visit us. Great post! Thanks for sharing this valuable information. Nice Blog. Thank you for sharing. not possible. I sage all people how to want to make your business on the top contact us. awesome mouthwartering :D thanks for sharing. searching fr new dishes in online. this is preety asesome. DevOps is a set of practices that automates the processes between software development and IT teams, in order that they can build, test, and release software faster and more reliably. The concept of DevOps is founded on building a culture of collaboration between teams that historically functioned in relative siloes. The promised benefits include increased trust, faster software releases, ability to solve critical issues quickly, and better manage unplanned work. Thanks for sharing with us. This is very Great aticle , it gives more useful information. Excellent blog admin, share more like this. Thanks for sharing a worthy information. This is really helpful. Keep doing more. Nice Post. Thank you for sharing. Thanks for your blog. The information which you have shared is excellent. Nice informative post...Thanks for sharing..
Its my great pleasure to be here on your article!! for sure ill be back to read the next blog of yours. This post is very great idea. Such a wonderful concept and very creativities post. Thanks for your sharing with as. I love your way of writing. The content shows your in-depth knowledge on the subject. Thanks for Sharing. A debt of gratitude is in order for choosing an opportunity to talk about this, I feel incredible about it and love considering more on this theme. It is to a great degree supportive for me. Extra-ordinary post. Looking for an information like this for a long time. Thanks for Posting. Extremely Nice Blog I like the manner in which you clarified these things. I trust your future article will enable me to further. Your blog is very super! I am reading your blog regularly and I got more ideas from your post. Thank you for providing a useful concept. I think it is an unrivaled post. It helps enormous proportions of us. Such a far reaching number of a wealth of a responsibility of appreciation is all together for this data. The content you have given is Extra-Ordinary. Very interesting write-up. Looking forward for your next Post. Interesting post. Excellent thought, highly inspiring. Waiting for your future blogs. Hi ! This is very informative & interesting article.Nice to read your blog post first time ever. I really appreciate this post. Thanks for sharing this awesome post if you are looking for Residential building surveying please visit us. This is extremely enlightening and intriguing article.Nice to peruse your blog entry first time ever. I truly welcome this post. A debt of gratitude is in order for sharing this great post. Interesting substance which encourages me to get the indepth information about the innovation. To know more detils about the course visit this site. This is a decent article here with some helpful hints for the individuals who are not used-to remark that much of the time. A debt of gratitude is in order for this accommodating data I concur with all focuses you have given to us. I will pursue every one of them. It has been essentially unfathomably liberal with you to give transparently what precisely numerous people would've promoted for an eBook to finish up making some money for their end, fundamentally given that you could have attempted it in the occasion you needed. This is Very Useful blog, Thank you to Share this. Thank you so much for sharing this worth able content with us. The concept taken here will be useful for my future programs and i will surely implement them in my study. Keep blogging article like this. Great pieces of advice! You are doing good and I like your blog post. Thank you for sharing. this is very informative and intersting for those who are interested in blogging field. This is a very elegantly composed post, my compliments. I am examining your post from the most punctual beginning stage, it was so captivating to voteize and I feel on account of you for posting such an OK blog, keep invigorates regularly. Great Article… I love to read your articles because your writing style is too good, its is very very helpful for all of us and I never get bored while reading your article because, they are becomes a more and more interesting from the starting lines until the end. if you are looking for satyanarayan puja please visit us. Excellent post gained so much of information, Keep posting like this. Great post. I was once checking constantly this weblog and I'm impressed! Extremely useful information specially the closing part. I maintain such information much. I was once seeking this specific information for a very long time. Many thanks and best of luck you are looking for BEST NEWSMAGAZINE please visit us. This is really a valuable post... The info shared is helpful and valuable. Thank you for sharing. Are we eating healthy?? Are we really healthy?? How to reduce intake of salt in south Indian diet??? 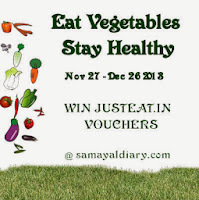 Wish to Just Eat Delicious Food ?